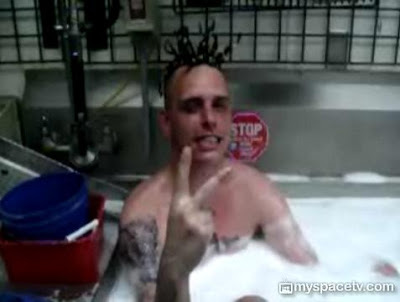 Home » burger king , comedy , fast food , food , humor , jackass , moral rot , ohio , stupidity , video , youtube » Burger King employee takes bath... in restaurant's sink! "The location's operators have thrown out all the utensils that came in contact with "Mr. Unstable", and have said that the sink has been sanitized twice"
They ought to have thrown out the sink along with the utensils. Because if I lived near that Burger King, I would never patronize that place untill they did. I think this seems like something Johnny Robertson should look into and leave those innocent children alone. I'd like to see Johnny and Charles Roark in the sink together. By the way, that place has a pretty large kitchen for a burger king. Just how many people do they serve eachy day? That thing looks like a reject from a Mad Max movie.